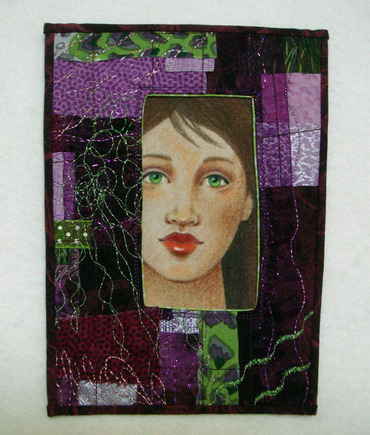 Here's the third framed face (technique learned in Angela Jareck's online class, Windows, at Dollstreet Dreamers) that's mounted on canvas. This time I decided to go with a purple colorway since it would let the blond hair contrast so vividly. I could have used the green/yellow colorway but I didn't want everything to blend in so much. This is a great way to use all those teeny tiny scraps that I just couldn't bear to part with. Here's the second framed face .. this time it's surrounded by yellows and greens. 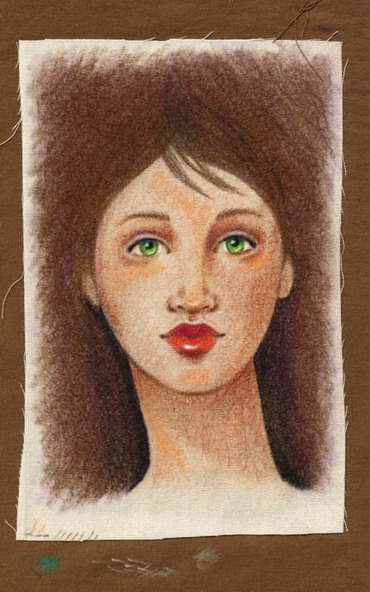 Once again, the face is drawn with colored pencils on a light muslin background. Technique learned from Angela Jarecki's online class, Windows, taught at Dollstreet Dreamers. There's a third one that's almost finished ... just need to add a few beads and mount it to the painted canvas. Can you tell that I'm enjoying making these? I'm making more of the faces that I learned how to draw in Angela Jarecki's online class, Windows. This time I decided that I'd mount them to one of those thick sided artist canvases to give it a bit more presence on the wall. The face is drawn with colored pencils on a piece of light brown cotton muslin - protected with a thin spray of Krylon Matte Finish. There's a variety of fabrics for the frame - velvety knits, batiks, iridescent rayons, and that rust colored decorator fabric on the left. Finished with a sprinkling of beads. What do you think? What color frame and canvas would you like to see for the next two? Green? Yellow? Blue? Purple? Or perhaps a neutral theme of beige, tan & brown? Or black & white? I'll need to make two more because I was invited to offer something for sell at the Open Studios that the Flying Phoebe Cloth Doll Club is hosting on Saturday June 4th & Sunday June 5th from 11am to 6pm at the Goose Cottage in Alameda, CA. It's at 1610 Minturn Street just off Lincoln between Grand & Union. If you're in the Bay area please come take a look. There's going to be some spectacular dolls and other art for sale. All projects were set aside this week because I wanted to finish three presents for my doll making friends. 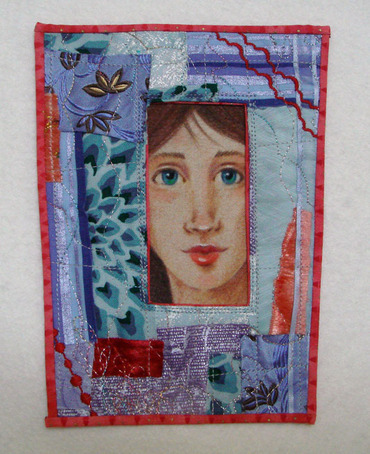 I've been wondering what in the world to make when I kept circling to the Windows quilts that I made in Angela Jarecki's workshop on Doll Street a couple years ago. Everyone has at least a small space on their wall for another piece of artwork. Here they are in the middle stage .. faces drawn on fabric with colored pencils then protected with a light misting of matte spray fixative .. raw edge patchwork that's "quilted" with a variety of novelty machine stitches. Once that's done I get to the fun part, creating a window for the face to peek through. 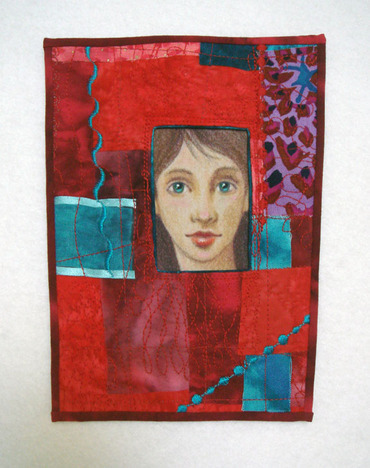 Once the window is made and the face has been stitched into place I sewed on a few beads for extra glitz and texture. Finally I added a backing fabric with matching ribbon hanger and then satin stitched the edges. Luckily my friends were happy with them! 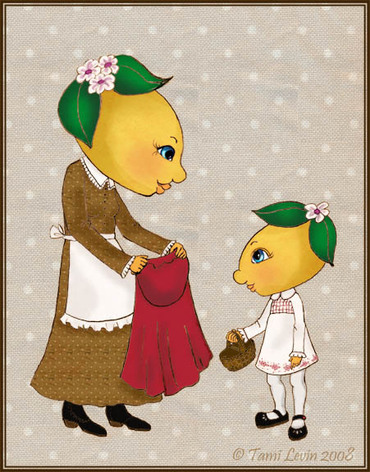 If you want to learn how to make one of your own, I believe that Angela's class is still up on Doll Street here. This past weekend was another race event at Laguna Seca near Salinas and Monterey (Steinbeck country). In between working the radio at the hot pits for Steve, I took a little time to do this colored pencil illustration on fabric. It's pretty much done, but I may add a few more highlights and shadows here and there. It's destined to be the first window in the Summer quilt. I've completed the sewing portion of my windows quiltlets from the Angela Jarecki class. Now I just have to embellish them with a little bead soup; however, I couldn't wait until then to show them to you. They are approximately the size of a postcard, 5" x 6" at the widest part. 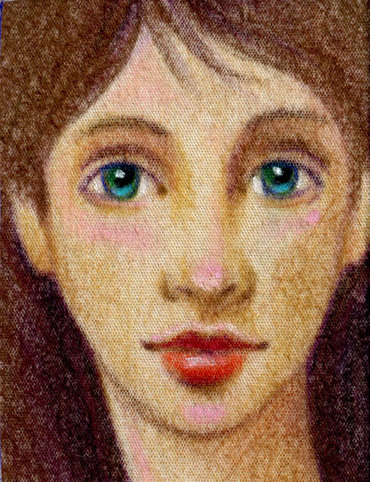 Here's a second face drawn on fine woven cotton using colored pencils. I think that it's time to go the next assignment in Angela Jarecki's online class - the window. After I make a few I'll go back and practice some more on my faces. This one isn't quite as innocent looking as my first one. I wonder why. My first week's homework from Angela Jarecki's Windows class. It'll be interesting to see what my last week's face will look like. Already I like how she approaches drawing a face with shadows rather than lines. Back to the drawing board for more practice. I desperately need to get an electric pencil sharpener for my colored pencils. They dull so very quickly on fabric.